In 1871, George White organized the Fisk Jubilee Singers at Fisk University in Tennessee, in order to raise money for the school. They were a group of black students from Fisk University who performed spirituals in the concert setting. While previous black concert artists performed standard white repertoire, the Fisk Jubilee Singers gave performances of black music, and this music did not follow the prevalent minstrel stereotypes. In 1898, John Wesley Work II, a later director of the group, helped get the Fisk Jubilee Singers recorded. 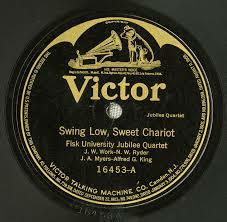 This recording here is “Swing Low, Sweet Chariot,” which was one of the Fisk Jubilee Singers’ best tunes of the time. 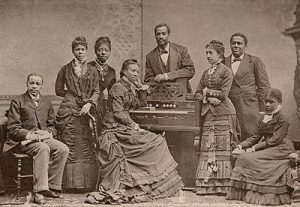 The Fisk Jubilee Singers had a major influence on the introduction of the spiritual into American repertoire, but the group had to adapt their style in order to have that effect. The director of the group, John Work, carried out a deal with Victor Talking Machine Company in hopes of reaching a wider audience. In Richard Crawford’s America’s Musical Life, he states that the purpose of the Fisk Jubilee Singers was to bring the history of Southern slaves into the present culture of Northern urban Protestants. The Jubilee singers dressed very properly and were polished in both behavior and musicality. They also didn’t sing in a dialect. This recording from Victor seems to have the typical sound of the Fisk Jubilee Singers, but it may not be representative of how the slaves in fields would have sung these songs. The Fisk Jubilee Singers were working against preexisting stereotypes and a racist society, so they found a more appealing sound that still maintained the idealized fervor of slave music to resonate with the white audiences. This reflects the idea of white people adapting music from other cultures or forcing others to match their own tastes of music, like we can see with Theodore F. Seward’s arrangement of Go Down Moses, in that it takes a standard spiritual and sets it within white hymnody. While they did everything they could to appeal to their white audience, and were successful in that, they were still not always taken seriously. Even the Victor record company claimed that “they sometimes excite to laughter by their quaint conceptions of religious ideas.” The white audiences thought of them as novelties. Yet, Victor praises the Fisk Jubilee Singers’ emotional appeal to all. We should be grateful for the contributions of the Fisk Jubilee Singers, as they helped with the acceptance, development, and preservation of spirituals. It is also important to acknowledge their struggles in promoting this music and how that has affected the development of the genre. Crawford, Richard. America’s Musical Life. New York: W. W. Norton & Company, Inc., 2001.